Synopsis: The G.I. Joes are back and facing enemies from outside the U.S. and from within. With Cobra manipulating both sides, the Joes are going to have to fight for their very existence. Andrew: Last night we finally got the chance to see G.I. 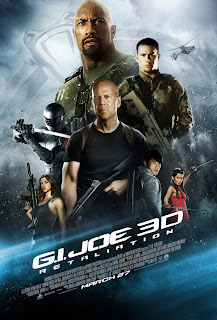 Joe: Retaliation, the sequel to 2009s G.I Joe: Rise of Cobra, starring Dwayne "The Rock" Johnson, Channing Tatum, Jonathan Pryce, Adrianne Palicki, D.J. Cotrona and Ray Stevenson. You, Sarah, weren't really familiar with the G.I. Joe series until about a week ago when I had you sit down and watch the first one. So I want to get your take first of Rise of Cobra briefly and then compare it to Retaliation. Sarah: Well, both of these movies are pretty ridiculous. The first one was ridiculous to the extent that it was almost felt like an animated movie. Things happen that would never happen in our world as they tended to defy laws of physics. It was just pretty unbelievable; pretty action packed. A lot like a Michael Bay movie actually. And the second one didn't disappoint in that category either. I thought it was ridiculously over the top and a little silly. But I think that's what people have come to expect from these movies: silly with some pretty awesome fight scenes. And there were really only two pretty awesome fight scenes and those are the ones that involve the ninjas. A: The ones with Snake Eyes and Storm Shadow? S: The one with Snake Eyes and Storm Shadow; Snake Eyes and a whole host of red-clad ninjas...I just liked the action. I thought it was pretty cool. A: Were there any differences between the two that you noticed? S: Definitely! What was weak to begin with in the first one was made worse in the writing of the second one. I thought the writing was abysmal. A: You thought the writing was worse than in Rise of Cobra? S: Not saying that it was good to begin with! Not saying that it was actually good, but I'm saying that this one was worse. S: Well I didn't like that only five of the original cast are in the second one. S: The President (Jonathan Pryce), Zartan (Arnold Vosloo), Duke (Tatum) for about a hot second, Snake Eyes (Ray Park) and Storm Shadow (Byung-hun Lee). They're the only characters that carried over, and I liked all the characters from the first one! I thought they fit the campy feel of the movie. Not saying The Rock doesn't but the secondary characters - Flint (Cotrona) was extremely weak, I'm not even sure if he was necessary as a replacement for Marlon Wayans' Ripcord. Sienna Miller isn't in this one, and obviously her character is still in jail, but I felt like the cast just wasn't as good. But enough about me, what did you think? A: Those were terrible and they made that a huge part of the movie and the marketing of the first one. In Retaliation they got rid of those which was a great idea. Instead, in the beginning you've just got normal Joes fulfilling missions, you get your war-like action and I thought the first few scenes were really really well done and staged well. I liked the choreography and just the methodical way in which they did their missions. A: He really just replaced Dennis Quaid's character, you know, that he was the original Joe and he's retired so they go to him for support, because the Joes get burned for all intents and purposes. I also liked what they did with the villains. I liked their more accurate depiction of Cobra Commander as opposed to Joseph Gordon Levit's unorthodox Cobra Commander in the first one. I liked Ray Stevenson as Firefly. I thought he was a good addition and a better villain here than Destro was in the first one. A: That doesn't surprise me (laughs)...I had fun watching Retaliation because of the action scenes and I think this one was another strong performance by Johnson, he's really kind of hitting his stride with the movies he's choosing. S: And with Pain and Gain coming up he's really kind of in a groove. A: By far the best scene in the movie and the main reason I even wanted to see it in 3D. A: Well I think a lot of why it was so bad was because of RZA's stilted pseudo-Asian accent and the script that they gave him. He was entirely miscast. They could have done without him entirely. A: In general, I enjoyed this one. I enjoyed it on the same level of the first one - they are campy, cheesy fun. They aren't good movies but they're "awfully" good. Movies that are bad but entertaining to watch, not unlike The Mummy movies really. S: Yeah I'm not a fan of these movies, I think they were kind of a let down and it was a HUGE mistake to kill off Channing Tatum and was just a train wreck from there. It's completely idiotic, but still well worth the watch for a good time. Nothing else, really. Good review.